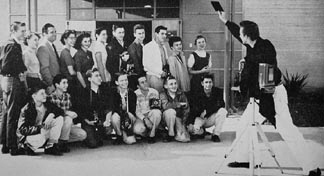 In September, 1955, a group of extremely clean-cut students filed silently into photography class. They sat down into brand new chairs, in front of brand new desks, in a brand new classroom, at a brand new Reseda High School. It was opening day for Reseda High, and these fresh faced kids were the school's very first students. They were probably thinking: "Jeepers, we can't wait to learn all about cameras and film!" Little did they know. These innocent, unsuspecting students would indeed learn about the process of photography, but much more importantly, they would also learn to see. And H. Warren King was there on day one, to show them the way. Warren "Mr. King" King began his teaching career at L.A. Polytechnic High School and Pierce College in 1950. 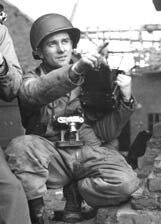 He came to teaching after three years as a WWII Signal Corps combat cameraman for the Army and Navy, followed by several years working as a professional photographer in Los Angeles. Mr. King also worked in television as a Director of Photography and a Producer, working on the series Q.E.D. for CBS, and creating more than twenty educational films.